View More In Black Light Fixtures - Page 5. UV curing: curing inks, adhesives, coatings, etc. Illumination of blacklight reactive pigments/paints/dyes, glow-in-the-dark applications, neon colors, fluorescence looking effect, etc. Plant growth, Aquarium, Fishing, Glow in the dark, etc. Special effects, parties, art work, painting, Halloween decorations, etc. *This is a UV lamp, the human eye can only see a small part of the light, so it will appear a little dim when lit. It is mainly used for fluorescence reaction and other purposes, if you just want to buy a violet light, it is not recommended that you purchase this UV lamp. *Please use this ultraviolet flood light in line with the local laws and regulations. 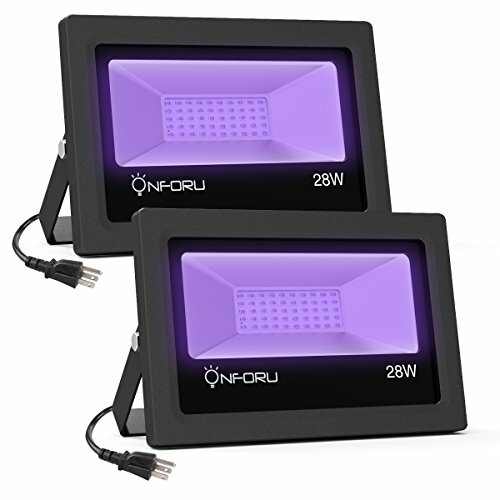 POWERFUL BLACK LIGHTS: 28W UV blacklight with 50 units ultraviolet LED (50,000 hours of long life, high power efficiency), 120 degree wide beam angle, covering a spacious living room, or yard or other outdoor party spot. Wavelength: 385-400 nm, UV-A level. IP66 WATERPROOF & VARIOUS APPLICATION: IP66 Waterproof rating, ideal for both indoor and outdoor usage. Perfect for Christmas , Halloween, Club, party, aquarium, band, theatrical performances, etc. DURABLE & EASY INSTALLATION: Die-cast aluminum housing, shock and erosion resistant. 50,000+ hours lifespan for LEDs,durable and energy efficient. Low heat, low power consumption. With US plug, the black light can be used anywhere with a power outlet, No need for wiring. Easy to position with adjustable bracket. If you have any questions about this product by Onforu, contact us by completing and submitting the form below. If you are looking for a specif part number, please include it with your message.